With the assistance of our staff we can help you select the right door for you. But, it’s only a garage door! Yes, that’s right, but it is also the largest moving object in your home. Safety first. The typical customer says we want the cheapest door. But, is that what you really want? Price differences between models of doors are minimal, quality is not. There are 3 types of steel doors on the market, non-insulated, semi-insulated, and fully insulated. The main reason for insulation is strength second to help with the heat and cold transfer. Just imagine your child running into the door with a bike or basketball. Doors without insulation or semi-insulated will ding and dent very easily. Fully insulated garage doors are a 3-layer construction with insulation sandwiched between 2 layers of steel, making them a solid door. 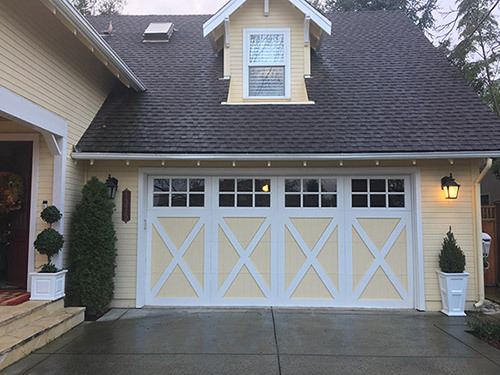 Raynor garage doors have taken the insulation and strength to the next level. Innovations by Raynor offers the use of polyurethane insulation, giving their doors a higher r-value rating 13.08-18.00. Raynor also offers a wide selection of panels and colors, giving your house that custom look without the custom price. Optional window packages are also available. For more information about Raynor garage doors click here. The other main line of doors we carry is Clopay. Clopay also offers a basic line of steel insulation door that range from a 6.5 to 9.0 r-value, with a polystyrene center and 3 layer construction. One of their newest line is the Coachman series. The Coachmen series gives you that custom look for a low cost. The steel and vinyl construction give you a low maintenance product with that custom door look. Check out the Coachmen series on the Clopay website by clicking here.